The Kasbah has been funded by Laboratoire HÉVÉA and is at the heart of a socially responsible tourism project. Situated in the Valley of Roses in Morocco, Kasbah des Roses welcomes travelers in search of adventure and genuineness. Each guest will enjoy their own sensorial experience immersed in the Berber region. Perfume and rose workshops are organized to promote Damask rose and at the same time to support the tourism sector in the Kasbah des Roses in Morocco. 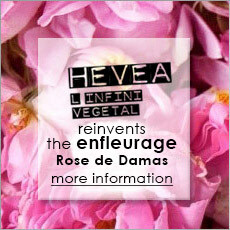 Laboratoire HÉVÉA carries out the Damask rose enfleurage at the very heart of the Valley of Roses. Damask roses are a complementary activity for Moroccan people who grow them in bushy hedges to mark off shepherds' plots. The argan oil is produced according to traditional methods by a Berber women's cooperative established near Essaouira which guarantees an oil of a very high quality. This oil is used for the elaboration of HÉVÉA products.